On Wednesday 3rd February 2016, shipmates of Huntingdon & District Branch held their Annual General Meeting at the Falcon Inn, Huntingdon. One of the main orders of business is the election of Officials. With the exception of President and Vice President, Officials are elected for a maximum of two years at a time, after that they must stand down, but are eligible for re-election if nobody volunteers for that post. Sadly, at this AGM, shipmate John Hard announced that he was also standing down from his role as Vice President due to personal commitments. After thanking John for his time in post, S/M Karl Webb nominated one of our most respected shipmates, S/M Dawn Holt, as our new Vice President. Thankfully, S/M Dawn Holt accepted the nomination after every member in attendance at the AGM agreed that she was the perfect choice for the role. Our President was also pleased to welcome Dawn, especially as he has been married to her for almost 61 years. This is a first for the Branch, S/M Graham Holt (Cdr. RN (Rtd)) and S/M Dawn Holt (ex PO Wren) both joined the RNA 37 years ago. 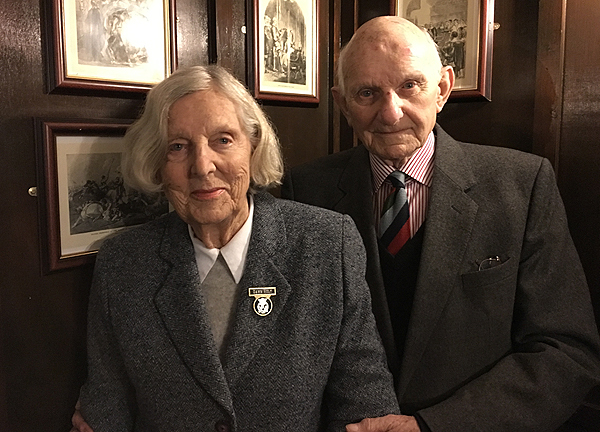 Before moving to Huntingdon, Graham was the President of Bridport Branch, he was elected as a Life Vice President of their Branch and remains in regular contact to date. On leaving Bridport RNA, S/M Graham Holt was presented with a Vice President’s badge; since Dawn’s election, Graham has proudly handed this badge of office to her to wear at RNA meetings. S/Ms Graham and Dawn Holt’s naval commitments do not end there, they currently have a grandson who is a serving Sub Lieutenant (and now carries Graham’s sword on Parade). Shipmates from Huntingdon & District Branch wish S/M Dawn Holt well in her new role, BZ shipmate.